Masks are to disguise, frighten or impress the viewer or to protect the wearer or to turn them into something else. Masks are personalities. We all 'put on a face to meet the faces we meet'. We all need protective make up in social situations. Our inner selves are vulnerable and need camouflage or armour. The danger is that we cannot distinguish from the inner and the outer. We develop complex characters for ourselves that become petrified and do not allow the inner self to breathe. When the mask cracks there can be stress or even breakdown. 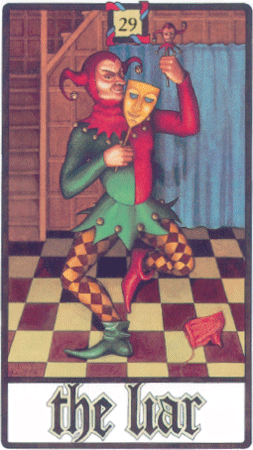 The Liar Card is warning us that we are not being true to our inner natures.